Triangle UXPA - [UX Book Club] Raleigh Book Discussion of "Designing with the Mind in Mind"
[UX Book Club] Raleigh Book Discussion of "Designing with the Mind in Mind"
Let's get together late August at Centerline Digital in Raleigh to discuss Jeff Johnson's "Designing with the Mind in Mind." We'll geek out over the cognitive "why" behind design rules and discuss the always-fascinating topic of how visual design can affect our perceptions and behaviors. "Developed from a course titled "Human-Computer Interaction" that he taught at the University of Canterbury in New Zealand, Dr. Jeff Johnson -- who holds degrees from Yale and Stanford, experience at Xerox and author of the book, "GUI Bloopers" -- offers contextual explanations as to how we visualize and categorize information, data and images in such a manner that engineers and programmers can design user interfaces in the most effective manner. It's a well-written, insightful and very practical guide that will be of interest to anyone interested in the how-and-why of computer/machine interface design. And, a discussion of time requirements for systems designers to consider. 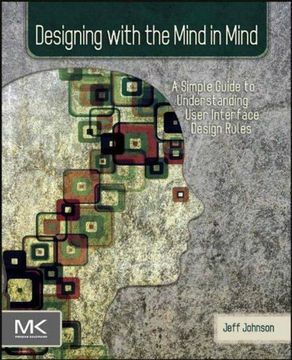 Written in an easy-to-understand narrative, lecture-format with dozens of illustrations in each chapter, readers will find this book to be a delightful and welcome primer detailing the fundamental psychological principles behind effective design rules."